Andy Warhol (Andrew Warhol, Jr.; August 6, 1928 – February 22, 1987) was one of the most famous American artists of the latter half of the 20th century. Many people think that Warhol is the "bellwether of the art market". 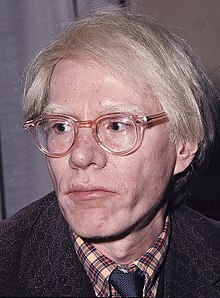 Warhol was born Andrew Warhol, Jr. in Pittsburgh, Pennsylvania on August 6, 1928. He graduated from the Carnegie Institute of Technology before moving to New York. His first big break was in August 1949 when he was asked to illustrate an article in Glamour Magazine. He dropped the 'a' from the end of his name when the credits read "Drawings by Andrew Warhol". Warhol was also famous for painting Campbells' and Watties' soup cans. He painted about 300 different paintings. . He originally worked as a commercial artist. He designed things like advertisements and window displays for stores. He soon became famous as an artist in the Pop Art movement, in which everyday objects and media images were used. One of his most famous paintings is his colourful portrait of American movie star, Marilyn Monroe. After she died he was deeply moved, and wanted to create some sort of memorial. In 1968, Warhol was shot by Valerie Solanas. In 1987, Warhol was in a hospital in New York City after an operation on his gallbladder. He died in his sleep from a sudden post-operative cardiac arrhythmia, aged 58. His family sued the hospital for inadequate care, saying that the arrhythmia was caused by improper care and water poisoning. ↑ "Andy Warhol: Biography". Andy Warhol Foundation for the Visual Arts. 2002. ↑ "A special report on the art market: The Pop master's highs and lows". The Economist. November 26, 2009. Retrieved August 14, 2010. ↑ Boorstin, Robert O. (April 13, 1987). "Hospital Asserts it Gave Warhol Adequate Care". The New York Times. Retrieved January 2, 2009. Wikimedia Commons has media related to Andy Warhol. This page was last changed on 9 March 2019, at 17:16.